people show friends and loved one how much they care. on February 14, 269 A.D. by St. Valentine. even touched, they must be felt with the heart." Orrrrr.... In my case... felt at the race track!! of the call... "Gentlemen Start Your Engines!!" THIS IS WHAT VALENTINE'S DAY MEANS TO ME. Yeah Man! It's that time of year again! the best time of the year in our family. We often forget all about Valentine's Day. That is until the day arrives. NASCAR President William H.G. 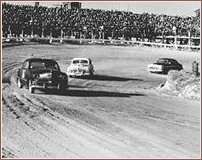 "Bill" France had no idea what to expect when he launched the first season of NASCAR racing with a Modified stock car event on the beach/road course in Daytona Beach, Fla., on Feb. 15. But by the time the inaugural season was complete, it had set a example for the years that followed by being comprised of more than 50 races. In its first year NASCAR was already known for close competition, thrills and die-hard allegiances to both manufacturers and driving heroes. With a strong history of drivers and mechanics tinkering under the hood of their hot rods, racing always has been about finding ways to go a little faster than the next guy. I hope you weren't expecting the traditional Valentine's Day History. If you were you'll have to just go and look at the million other Valentine's Day pages on the net. For me Valentine's Day holds a very special meaning. "God never closes one door without opening another." My story begins on a blistering hot night in August of 1994. My husband and I met through a mutual friend of ours who thought we would make a perfect couple. Guess what? She was right!! We were supposed to meet at a party she held on July 4th but Chuck chickened out! *grin* So rather than wait until the next party I decided to take matters in my own hands. Pushy woman that I am. :o) I asked my friend for his phone number. It took me over a month to get up the nerve to call him, finally that Wednesday night I did. We talked for hours... It was great!! We had so much in common. The next night we talked again for hours and agreed to meet the following night. That night... August 12th, 1994 was the night my whole life changed. We continued seeing each other for the next two weeks. Neither of us wanting to part at the end of the evening. Anxious to take our relationship a step further, I made him stop at the store that night and I bought him a toothbrush. Heeheehee... Not because he had bad breath but because I wanted him to spend the night. :o) And we've been together ever since. October of 94 I sold my home and moved in with him and together we started looking for a new house. We found the house of our dreams in February. Now you are probably thinking okay that's nice but what does all this have to do with Valentine's Day? Well February of 1995 I went on my very first vacation without my parents. Chuck and I flew to Florida and on Valentine's Day I got to watch my very first Daytona 500 stock car race. Right in the very front row 4 feet away from the flag man at the start finish line. I was in seventh heaven. It was like a dream come true. And to top things off we put in a call to our realitor and the house was ours!! In all our excitement, neither of us even thought about it being Valentine's Day until that night in our hotel room where we wished each other a Happy Valentine's Day, on the balcony of the Howard Johnson's tower in Orlando, where we kissed and went inside and promptly feel asleep after an exhausting day at the track. See Dreams Really Do Come True!! Chuck n' I were Married on December 22nd, 1995 So far we are living happily ever after. You can read about our wonderful wedding day here. The greatest magic Chuck and I share is our ability to make each other laugh. That and of course Peanut who is a never ending source of smiles.